It's been quite awhile since we did a post of bloopers and outtakes, and Cod only knows we have plenty of them! Since toys are my favorite things in the world, and it brings Mommy such joy to watch me having fun, she's constantly picking up the flashy box when I start playing. The results usually aren't pretty though because "blurry tortie" is my middle name. 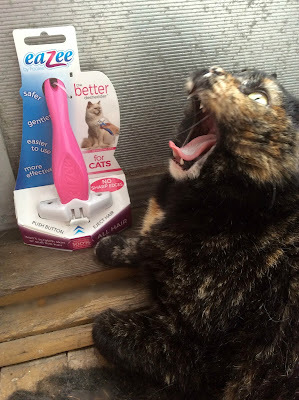 These pictures were taking during the unboxing of this month's CatLadyBox. I told Mommy to delete them because they're embarrassing but she found them so funny that she saved them. I gave her permission to use them on a blooper reel only. And lastly, guess who's blurry again? Ha ha! 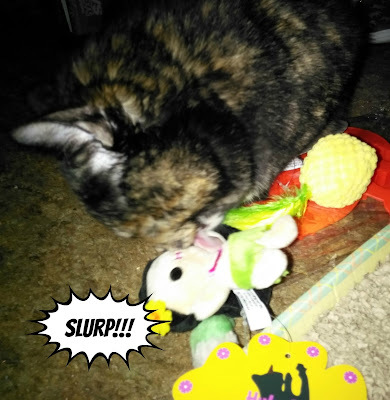 I have a blurry tortie too. Looks like you're just having too much fun to stop and get your picture taken! You could never snap an embarrassing shot, Mudpie. You're just too purrfect! And we sure do know all about blurry here at our house, too. Purrs! 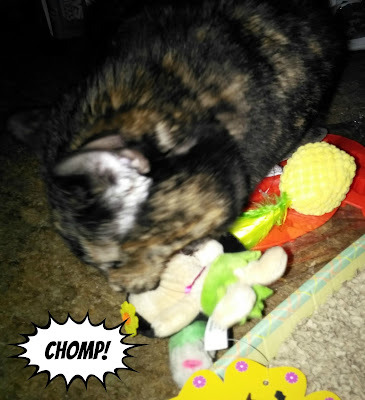 Blurry tortie is just as beautiful as not-blurry tortie. And it's fun to see you playing ... we can tell you're quite ferocious! We love it! This is giving us and idea... maybe outtakes and bloopers are a new trend! Mudpie, you are darling no matter what! But that open yap photo next to Eazee Pet de-furrer is my fav today! We love your bloopers! 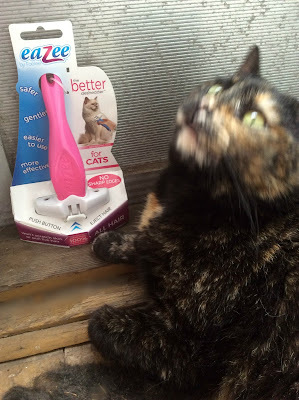 Blurry Tortie or not, you're always gorgeous! We are often in constant motion too when mum gets the camera. When she puts it away we are purrfectly still. Great outtakes! Of course, you are lovely in each one, Mudpie. OMC! Those look like a lot of the bloopers we have! Mudpie! Even when you are bloopering you are irresistible!!! Those are great, you are a cutie. HAH! TW doesn't feel so bad now. Love the next to last. That ain't no blooper. MOL! These are great! 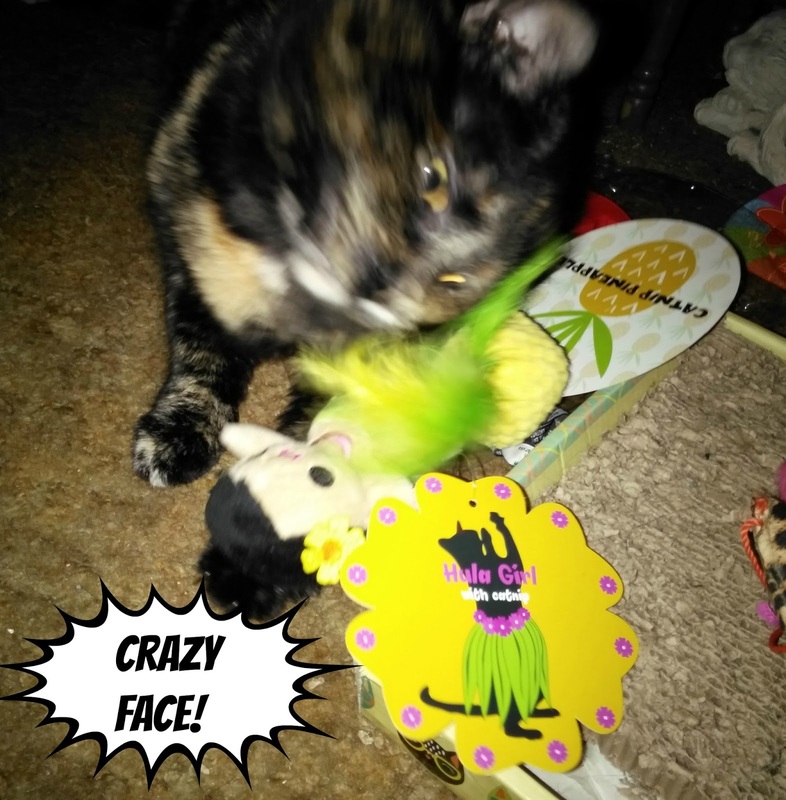 I can tell you were REALLY enjoying your toys from the Cat Lady Box.